Among the lepiotoid mushrooms, this is one of the more distinctive species. 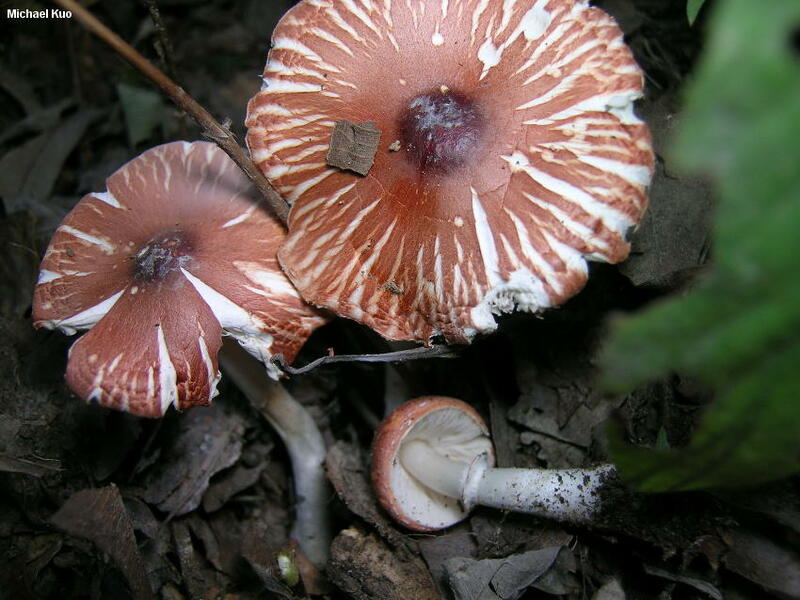 When young it is almost entirely coral pink or orangish brown, and has an egg-shaped to squarish cap. As it matures, however, the cap color begins to break up, resulting in the familiar lepiotoid pattern of stretched-out fibrils and scales over a pale background. The center of the cap, however, remains evenly colored and dark, although the rest of the cap may fade to orangish or coral pink. The distinctive cap, together with the absence of any staining in the flesh, make Leucoagaricus rubrotinctus fairly easy to recognize. It is widespread and common east of the Rocky Mountains, and rare in the west. 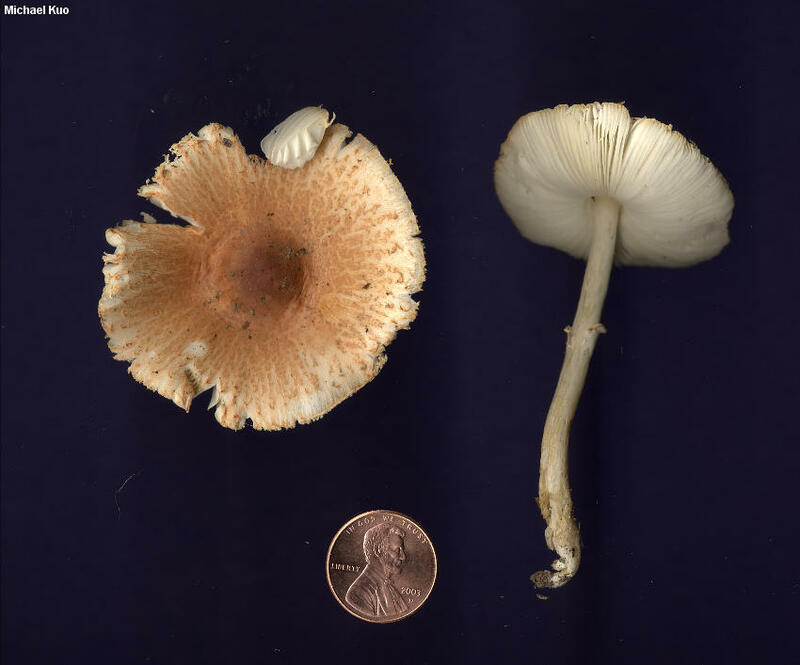 On the West Coast, Lepiota rubrotinctoides is similar, but more brown. 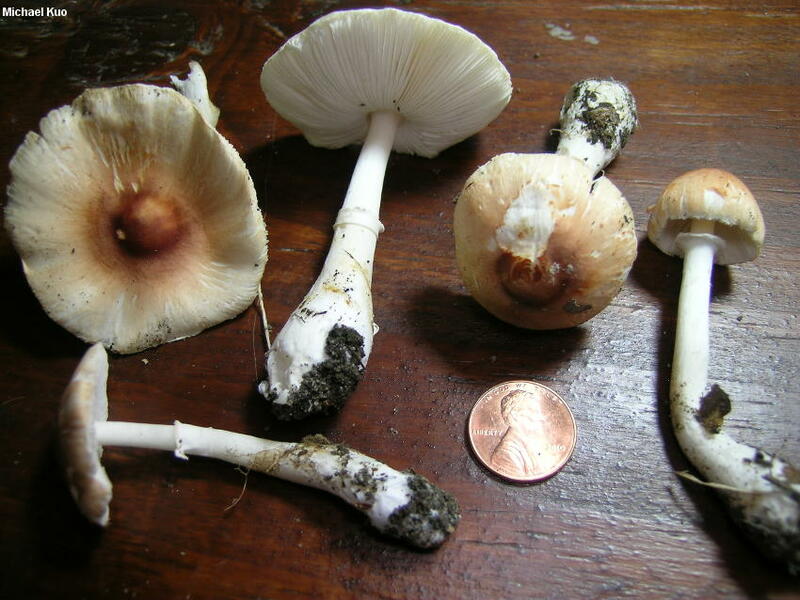 Lepiota rubrotincta is an older name. 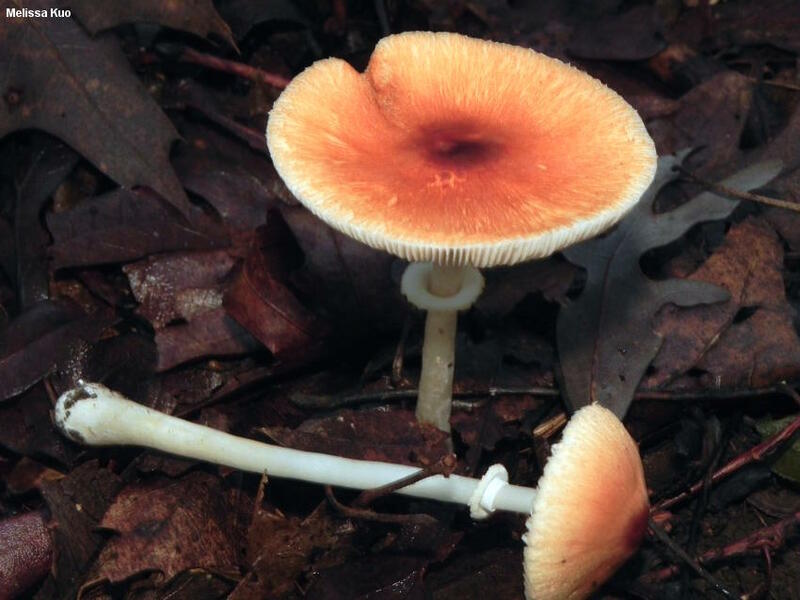 Ecology: Saprobic; growing alone, scattered, or gregariously in hardwood or conifer forests; sometimes found in compost piles and landscaping areas; summer and fall; possibly widely distributed in North America, but much more common east of the Rocky Mountains. The illustrated and described collections are from Illinois and Québec. Cap: 3-6 cm; at first egg-shaped to squarish, and pink to pinkish orange or orangish brown overall, with a darker center; expanding to broadly convex, with a shallow central hump, or nearly flat; dry; developing pinkish brown to reddish brown, radial fibrils and scales over a whitish to pale tan or orangish ground color--but the center remaining distinctively darker reddish brown; the margin not lined, but often splitting in age. 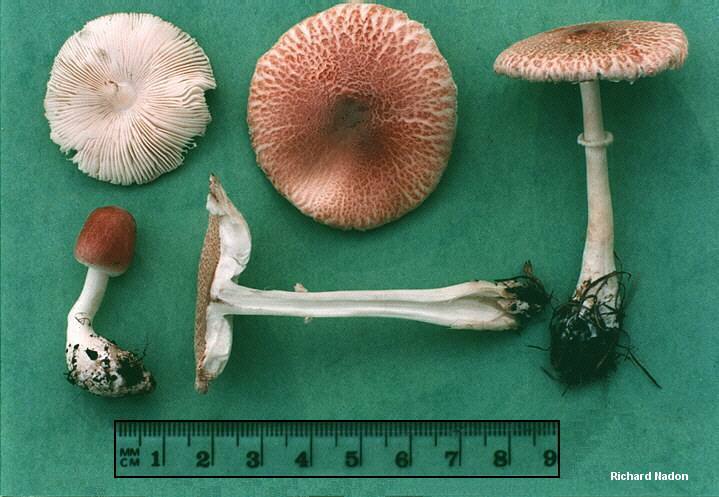 Gills: Free from the stem; close; short-gills occasional; soft; white; not bruising or staining. 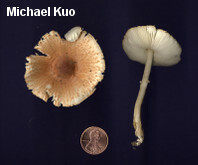 Stem: 3-10 cm long; 0.5-1 cm thick; more or less equal, or with a club-shaped base; dry; bald; with a white ring on the upper stem that often develops an orangish brown to reddish brown edge; basal mycelium white. 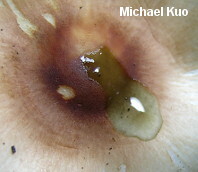 Chemical Reactions: KOH slowly dull olive to bluish green on reddish brown areas of cap. 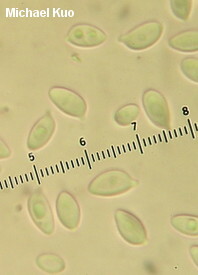 Microscopic Features: Spores 6-9 x 4-5 µ; ellipsoid or somewhat irregular; smooth; thick-walled; hyaline in KOH; dextrinoid. Cheilocystidia abundant; tightly packed; 30-50 x 5-10 µ; cylindric, or occasionally subfusiform or subclavate; smooth; hyaline in KOH; thin-walled. Pleurocystidia absent. 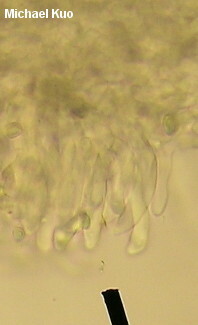 Pileipellis a collapsing trichoderm (elements only upright in the center of young caps) of smooth, unclamped elements 5-10 µ wide; hyaline to yellowish in KOH; terminal cells cylindric, with narrowed apices. REFERENCES: (Peck, 1884) Singer, 1948. (Kauffman, 1918; H. V. Smith, 1954; Smith, Smith & Weber, 1979; Phillips, 1991/2005; Lincoff, 1992; Horn, Kay & Abel, 1993; Breitenbach & Kränzlin, 1995; Barron, 1999; McNeil, 2006; Kuo & Methven, 2014.) Herb. Kuo 08290205, 07220306, 09291101, 09171403.